A delightful collection of stories spanning the past, the present and the future, ranging from villages to cities, from the mundane to the extraordinary, from external events and societal norms to internal conflicts, confrontations and catharses of characters, Different Beads of the Same String promises an interesting journey set in contemporary Indian society. I have a very strong liking for short stories, I often pick up books with short n crisp stories and prefer reading them rather giving out time to full length novel, I was scrolling down amazon.in and that is when I came across 'different beads of the same strings', I read the blurb and voila, I knew that I just got the perfect read for the weekend. let me tell you I completed this book in a single siting of 3 hours. 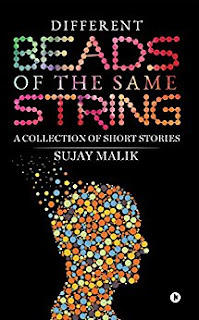 Sujay's writing style is so captivating that I couldn't keep the book down for a I have a very strong liking for short stories, I often pick up books with short n crisp stories and prefer reading them rather giving out time to full length novel, I was scrolling down amazon.in and that is when I came across 'different beads of the same strings', I read the blurb and voila, I knew that I just got the perfect read for the weekend. let me tell you I completed this book in a single siting of 3 hours. Sujay's writing style is so captivating that I couldn't keep the book down for a minute and kept it finally when I was through it. it was such an enthralling one, from romantic stories to one with good twist n turns, it has everything that a person will expect from this book after reading the blurb. from book cover to the way it is written, from its short synopsis to the exceptionally good one liners, this book is just mere perfect with absolutely no flaw. I felt if the mrp could have been a lil less, it would have been good otherwise content wise this book is worth ur money. a perfect book that should be present in your bookshelves.